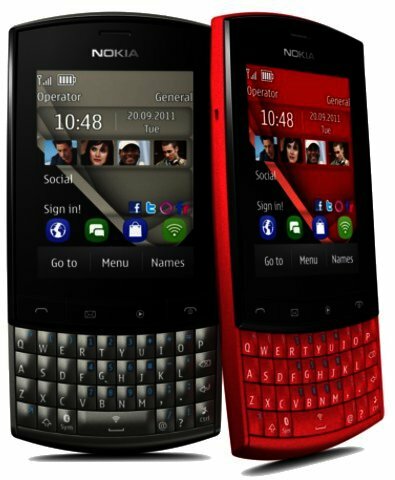 Nokia launched its Asha range of S40-powered feature phones locally during April 2012. These are aimed squarely at the youth segment of the South African mobile phone market, as well as users who aren’t quite ready to make the jump to more complicated mobile operating systems running on smartphones. In order to appeal to that target audience the range topping Asha 303 sports a compact (116.5 x 55.7 x 13.9 mm, 99 g) and fairly attractive design, characterised by a sturdy build and premium materials (brushed metal curved back cover) normally found on pricier handsets. This touch-and-type feature phone boasts a 2.6" (240 x 320 pixels) TFT capacitive touchscreen, with a below par 154 ppi pixel density (you want 180 ppi and up). However, it is not as bad as the paltry pixel density of just 125 ppi available on the LG Optimus L3 smartphone. Since this isn’t a Nokia Clear Black display, it also doesn’t do the greatest job of keeping glare at bay when you use the phone outdoors in direct sunlight. The display is coupled with a QWERTY keyboard and although there isn’t any spacing between individual keys, we still found this keyboard easy to type on, though not as convenient as our QWERTY keyboard of choice, RIM’s (Research In Motion’s) BlackBerry keypad. We also liked the handy quick button shortcuts to functions such as Bluetooth and Wi-Fi, which has you holding down the space button for example to be taken to the Wi-Fi menu. 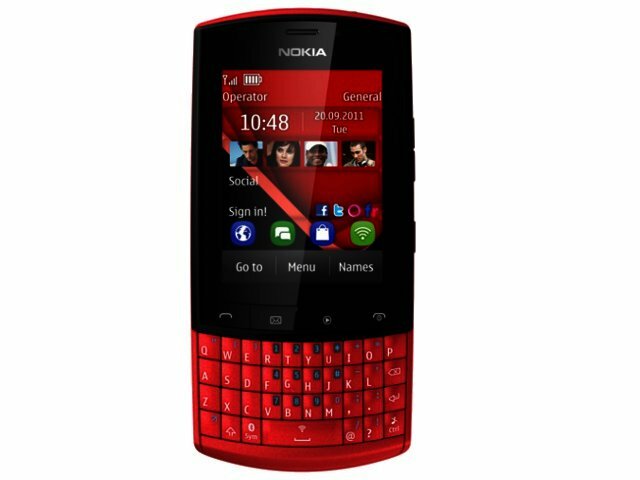 Powering this mobile phone is a zippy 1 GHz processor (make not specified) with makes especially quick work of opening, closing and running apps and navigating Nokia’s S40 mobile operating system (OS). S40 doesn’t support multi-tasking, so you won’t be able to check your email quickly before resuming with that challenging Angry Birds Lite level. This easy-to-use mobile OS sports a very basic user interface with a singular homescreen, containing up to four rows of app shortcuts that you can edit. In addition, it also supports swipe gestures, making it possible to swipe either left or right anywhere on the homescreen to launch an app. For instance, we set our homescreen so that swiping left automatically takes us to the gallery, whilst swiping right opens the camera interface. In addition, the Asha 303 offers some other functionality that one normally finds on smartphones as opposed to a feature phone like this. These include access to the Nokia Store for downloading apps and push email support for popular email service the likes of Gmail, Hotmail, and Yahoo! mail. The Nokia Store houses over 100 000 apps compared to the Google Play Store’s 500 000 and Apple App Store’s 600 000. Most of the apps in the Nokia Store are also for Symbian (latest version being Nokia Belle), and not for S40 devices, but you do get some decent ones including Foursquare for Series 40 and Zoopy. Users only have access to around 100 MB of onboard storage to store these apps and their multimedia content on, but you are able to expand upon this via a microSD memory card with support for cards up to 32 GB in size. A 2 GB card is included in the box. In terms of connectivity, the Asha 303 boasts 3G HSDPA, with download speeds up to 10.2 Mbps and upload speeds up to 2 Mbps, as well as Wi-Fi 802.11n, and Bluetooth version 2.1. Also onboard is a 3.5 mm audio jack, Stereo FM radio with RDS, the Nokia Browser that the company believes compresses webpages by up to 90%, and a 3.2 megapixel fixed-focus camera. The latter also boasts a sequence mode, enabling you to snap up to five shots in quick succession. Unfortunately, this snapper manages only average photos, while it also lacks a flash. Luckily they are more than adequate to be included in an MMS or to be sent over Whatsapp Messenger. When it comes to video, this snapper records videos at VGA quality (640 x 480) at a surprisingly smooth 15 fps. An area where the Asha 303 feature will have the edge over similarly priced smartphone competition is battery life. Its 1300 mAh battery wasn’t even half way drained after two days of usage. Nokia might be having some difficulty luring smartphone users away from the iPhone and Android-based smartphones, but with the latest feature phone in its S40-running Asha range, the company shows why it remains a leader (now the runner-up, not the number one) in the mobile phone market. The Asha 303 features a premium design with some decent spec bang for sub-R1800 pricetag, including a zippy 1 GHz processor and an easy-to-use, albeit spartan, OS. It also serves up what were previously smartphone-only features, such as push email support, Facebook Chat integration, as well as connectivity to Nokia’s application store. It goes for a recommended retail price of R1799, which does put it up against some affordable Android-powered smartphones such as the LG Optimus L3 E400 (R1499) and Samsung Galaxy Gio (R1999). Its toughest competition will be from RIM’s evergreen BlackBerry Curve 8520, which you can still buy locally for under R1700. This device may have been replaced by the Curve 9300, followed by the Curve 9360, but its main drawcard for the youth lies in BBM (BlackBerry Messenger). For these users it will be a question of choosing between a stylish touch-and-type feature phone offering plenty of features, or an old school BlackBerry smartphone with which to chat with their friends. Speedy 1 GHz processor; affordable pricetag; touch-and-type device; grip-friendly design; excellent battery life. A feature phone in a world where a smartphone is king; not the most graphically enticing user interface; very average camera. Speedy 1 GHz processor; affordable pricetag; touch-and-type device; grip-friendly design; and excellent battery life. A feature phone in a world where a smartphone is king; not the most graphically enticing user interface; and very average camera.